First post regarding Darkest Night, YEAH ! So, in a lack of topics(the game is in a very early stage), I decided to write about my basic road map for the game in the next couple of weeks. It's not printed in stone, so things regarding the roadmap will change. 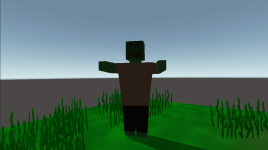 Week 45(this week): AI - I have been doing a simple zombie placeholder model, just to be able to create a basic AI system. Weapon general tweaking - Will be tweaking the muzzle flash of the weapons and recoil. Week 46: Weapon general tweaking - Continue tweaking weapons. UI & Inventory system - Adding a inventory system with durability on items. Week 47: Map assets - Creating more map assets, preparing for the new map. Animations - Will be replacing old placeholder animations and will be adding hand animations. More updates coming soon ! Development is going great. Here's a simple placeholder model for the zombie, since I'm programming the AI right now.